Celebrate the best parts of summer together as a family with Ice Cream Blessings! From hitting baseballs across the field to jumping in a pool on a hot day to eating the very best ice cream flavors, these activities make summertime memories that will last a lifetime. The adorable characters and simple rhymes make this board book a delight for both little ones and their parents. We love to swim and play and float throughout the day. We laugh the time away! Splash. Splash. Splash. Let's all jump in the pool! With a reminder that all blessings come from God, Ice Cream Blessings will inspire you to plan fun activities and enjoy summer to the fullest. 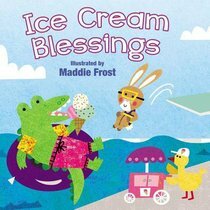 About "Sweet Blessings: Ice Cream Blessings"